We have to get to church on time today! Pastor is showing the football game in the sanctuary right after service! His email says it is going to be a great day of worshiping together! I want to get early so we can get a good seat up front! Man, I love this church! I love this Pastor! who seeks your face, Oh God of Jacob . . . The final worship song by the worship team is visually interrupted by the church Media Arts Director in his attempt to flow seamlessly from the worship song into the game that has already started. A 12 foot tall cheerleader is projected up on the church monitors where the lyrics to Give Us Clean Hands used to be just seconds earlier. She is bent over at the waist showing her backside while looking back over her shoulder at the audience. “Sorry . .” he quickly interjects over the church sanctuary PA as people start moving to the front of the congregation to get some of the “good” seats that are being vacated by some of the more “legalistic” brothers and sisters that aren’t staying for worship and fellowship during the game. I could end this post right here. I think many that read the bible understand at least one of the commandments that was broken here and they also understand the gravity and implications of it being done in the church sanctuary. 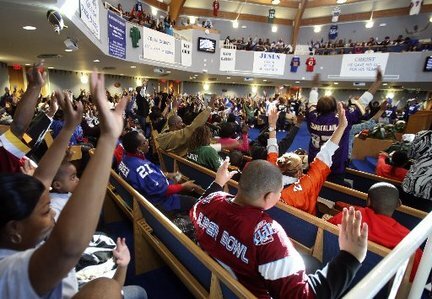 There are churches all over America playing NFL games in their sanctuaries. Pastors all over America initiate this. Pastors all over America rationalize and defend the NFL as being compatible with a Godly lifestyle in spite of and in contradiction to what the text says. Pastors all over America are discipling people to love the world and worldly things. They do it by participating. They do it by initiating. They do it by rationalizing. They do it by preempting sermons so that people can get home for the start of the game. Some of these Pastors are very much and dearly loved friends. If confronted by Nathan himself, they would not drop to their knees in repentance. They would not tell Nathan “I have sinned against Adonai.” They would see no need to repent because they see no need to change. Their love of their traditions and their love of the NFL supersedes what the NFL represents – what it actually promotes. The Pharisees are in error, not them! 11 For God’s grace, which brings deliverance, has appeared to all people. not even an embarrassment at all. Narrow gate or wide road? Hot, cold, or luke warm? I share these teachings in love, not in condemnation. To teach right thinking and doing . . . This entry was posted in Thoughts and tagged Adonai, amplified, cheerleader, Christian, christianity, church, church sized man cave, churches, cold, corruption, crew, david, Discipleship, Ekklisia, expounded, fan or follower, Give Us Clean Hands, God, hot, legalistic, luke warm, man cave, narrow gate, nathan, NFL, opposition, pastors, penalty, perversion, Pharisees, rationalization, rationalize, rebellion, ref, referee, sanctuary, Titus 2, Titus 2:12, wide road. Bookmark the permalink. This is prompted by several true stories, one that happened this weekend. Great piece Bill! My prayer is our Lord uses this to convict. I think when it becomes your habit or your lifestyle to “rationalize”, a piece like this will be hard to “take to heart”…..all part of the “picture” of living worldly…..Having your cake and eating it also so to speak. But all the “rationalization” you do won’t mean a thing to help you when the time comes of your judgment. If scripture tells us…”with great trust (faith) comes great rewards”….what does it say about “rationalizing” worldly things?